The Victory Lift as it appears in Portal. Very, very good. A complimentary victory lift has been activated in the main chamber. 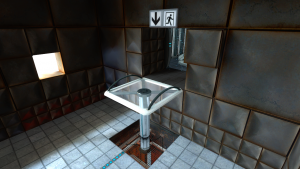 The Victory Lift, also known as the Piston Platform, is a game mechanic introduced in Portal, first appearing in Test Chamber 06. It also makes frequent appearances in Portal 2. The Victory Lift is a simple platform that rises when it is activated by the player. The primary function of the Victory Lift is to allow the player access to areas that would otherwise be inaccessible. Victory Lifts are traditionally activated when the corresponding Button is activated by the player, and will rise when the player stands on them. Some Victory Lifts do not require the player to activate them, and these platforms are usually activated upon completion of a Test Chamber. Victory Lifts will usually (but not always) descend when a player has disembarked the lift. This page was last modified on 14 January 2018, at 05:54.